After the Foodbuzz 24×24 Challenge I had a lot of left over red peppers. Pasta in our house is a real 20 minute start to finish creation which begins with me grabbing ingredients out of the fridge and ending with a meal. I am trying to stick to 5 ingredients for every pasta dish, and this one comes close. 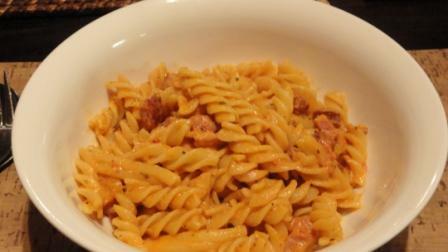 For Tandy Tuesday I made Recipe For Pasta With Chorizo, Bacon, Red Peppers And Tomatoes. I must admit that these are really pantry ingredients in my house.